He has rebuilt his political strategy around the vision of a “democratic-ecological-society” and developed a model to build up a civil society in Kurdistan and the Middle East… He has recommended Bookchin’s books to every mayor in all Kurdish cities and wanted everybody to read them. Because of repression in Turkey, these ideas have come to their fullest fruition in the historically Kurdish northeast of Syria. In 2012, the Syrian government troops of President Bashar al-Assad withdrew from this region to concentrate on fighting insurgents elsewhere. The Syrian Kurds had been watching their brethren implement some of Öcalan’s ideas in largely Kurdish towns and cities like Diyarbakir, across the border in southeastern Turkey; and they had been preparing for their chance. They began to put the same ideas into practice in three “cantons” in Syria, Cizre, Kobani, and Afrin, which are home to an estimated 4.6 million people, including 2 million Syrian Kurds, as well as smaller populations of Arabs, Turkmen, Syriacs, and other ethnic minorities. In these cantons, multi-ethnic neighborhood assemblies hold sway, and the prevailing ethos emphasizes an equal division of power between women and men, a non-hierarchical, non-sectarian, and distinctly ecological outlook, and a cooperative economy built on anticapitalist principles. The people of these cantons have made these reforms in the face of great challenges, which include a doubling of the population in the form of war refugees from other parts of Syria, and embargoes on food and supplies from Turkey to the north and Iraqi Kurdistan to the East, where the Kurdish tribal leader Masoud Barzani has for more than a decade overseen a capitalist statelet that depends on Turkey for trade. 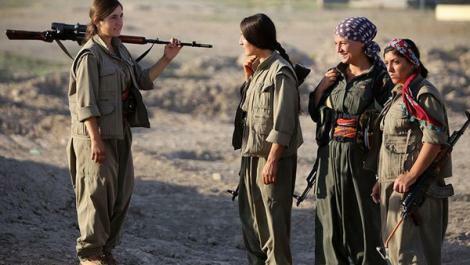 Against the backdrop of an entire society mobilized for the war effort, there have been contested complaints of child soldiers, uprooted Arab villagers, and other human rights violations in the Kurdish-controlled areas. Internally, there is the challenge of resisting the ideological rigidity that often befalls movements with a charismatic spokesperson when elites claim the leader’s mantle at the expense of dissenting views. Perhaps most crucially, it remains to be seen whether Turkey, which has stated its desire to obliteratethe Rojava project, will be brought to heel or given the green light by some combination of the three world powers—Russia, Iran, and the US—vying to exert control over Syria. The Social Contract’s intention, however, is clear—to build a grassroots-based, democratic, decentralized society of the kind my father and Abdullah Öcalan both envisioned. Turkey’s insistence that the Syrian Kurds, too, are “terrorists” because of their ideological affiliation with Öcalan has forced the US to walk a fine line—supporting the YPG and YPJ as part of the Syrian Democratic Forces, and denying their ties to the PKK, while maintaining that the PKK in Turkey is a terrorist group. The result has been that while US military officials vocally support the Kurds as “our best partners on the ground” in the fight against ISIS in Syria, the State Department has turned a blind eye to Erdoğan’s unrelenting human rights violations, echoing his rhetoric that the PKK must be destroyed, a policy that the Kurdish people say amounts to tacit approval of a war on all Kurds. This US policy, together with the near-silence of American and European leaders about the Turkish government’s assault against its Kurdish citizensbetween 2015 and 2017, may have emboldened Erdoğan to send his forces and the militias of former Free Syrian Army—including jihadists and former ISIS fighters—into the canton of Afrin in Syria on January 20. An estimated 170,000 people have since been displaced from Afrin; many are homeless and sleep in the open air. What was once a haven of peace and multiculturalism, a place where women held 50 percent of the public offices, is now under siege. There have been reports of abductions of women and girls, of Kurds’ being evicted from their homes and businesses, and of the partial imposition of Sharia law. In this, Turkey has received tacit support from the US, which has refused to stand up to Erdoğan on behalf of its Kurdish allies. The resulting devastation has been woefully under-reported by American media.